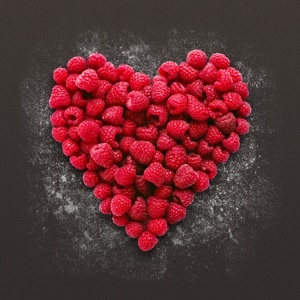 Healthy Desserts is an inspiring source of organic and tasty desserts for each and every sweet tooth out there. The recipes are filled with natural sweeteners, healthy fats, whole grains and fresh fruit that will tickle your taste buds. Enjoy and be delighted by creative recipes with drop dead gorgeous photos in full Retina and detailed, easy to follow, instructions. • Selected as Beautiful Cookbooks for the “Best of App Store 2013” • Reached #1 in Food & Drink category in 50+ countries • Only natural sweeteners, healthy fats, whole grains and fruits • Regardless if you aim to eat healthier or just want to spice up your menu of desserts for the weekend – Healthy Desserts is the perfect companion in your kitchen or while looking for inspiration on the go. "The mouthwatering photos do a great job of convincing you that these healthier options are still a delicious choice over something worse for you" – iMore --- New in Healthy Desserts 2.0 - Complete redesign of the app - New inspiring recipe list that takes you even closer to the recipes - New practical index view with all recipes grouped by category - A new, better structured, about view - Print recipes over AirPrint - Share recipes over AirDrop - iPad: Redesigned cooking experience with larger font - iPad: Instructions and ingredients can now scroll independently from each other - iPhone: Fullscreen recipe photos --- Features: → A good variety of cookies, bars, muffins and smoothies. → 66 handpicked premium recipes. → A seamless switch from US to metric units. → Save your favorites so you can return to them quickly. → Several stunning photos for each recipe! 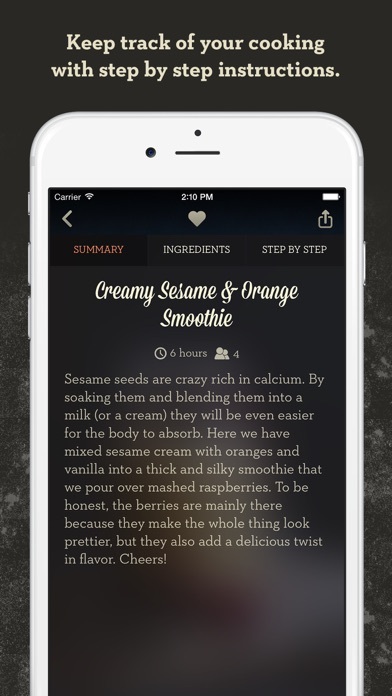 → Shopping list: Just email or SMS the ingredients to your iPhone! 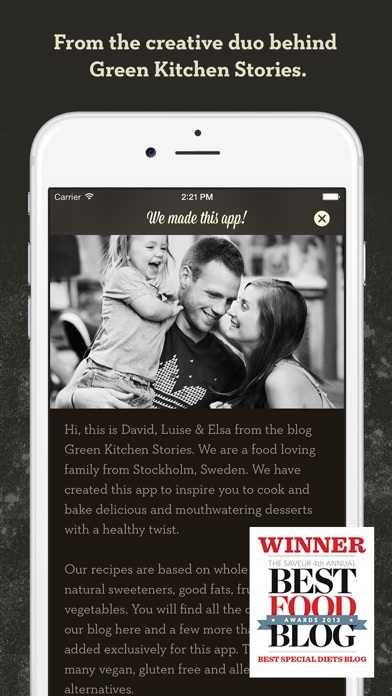 → Share or brag about your cookery on Facebook and Twitter! 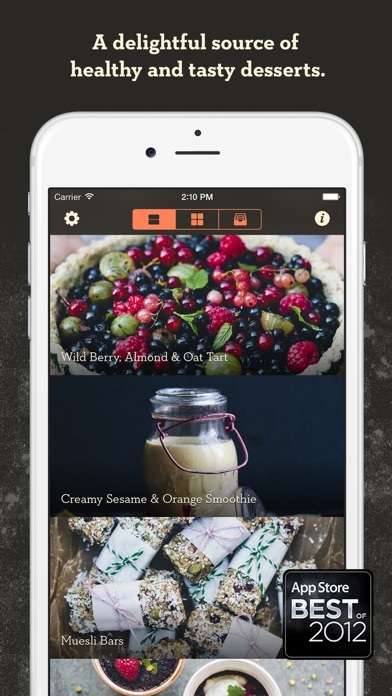 → Share recipes with friends and family over AirDrop. → Print recipes over AirPrint. → Estimated cooking time for each recipe. 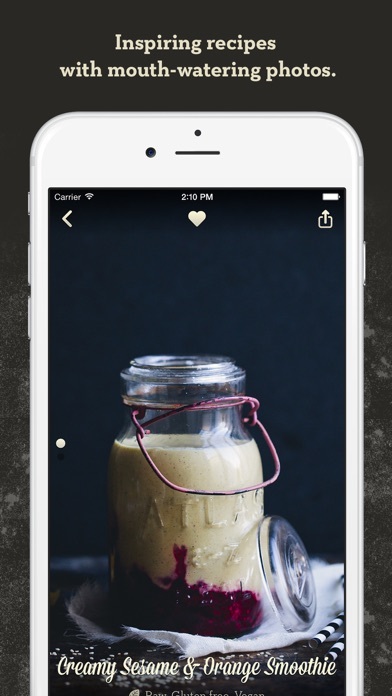 → All recipes are marked if they are vegan, raw, gluten free, naturally sweetened or whole grain. → Step by step cooking instructions, tap on a step to mark it as completed. → Universal app - run it on both your iPhone and your iPad → Stunning Retina graphics!